The record-breaking number of named storms during the 2005 hurricane season may have dominated weather news, but at the same time, another record was in the making: The year now stands as the warmest on record, according to some climatologists. This map depicts areas that have warmed (yellow to red) and areas that have cooled (blue to purple) during 2005. Significant warming was especially evident in measurements from the Arctic, the inclusion of which helped 2005 surpass 1998 as the warmest year on record. All images are courtesy of NASA. 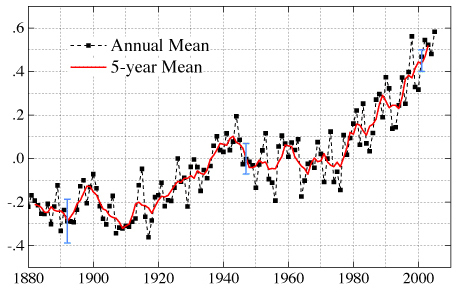 Global surface temperatures have increased about 0.6 degrees Celsius (1 degree Fahrenheit) since the mid-1970s. That increase culminated in 2005 with the highest surface temperatures ever recorded, according to a report released this month by James Hansen, director of NASA's Goddard Institute for Space Studies, and colleagues. 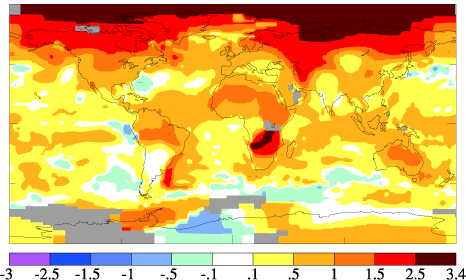 Other groups, including the National Oceanic and Atmospheric Administration (NOAA) and the World Meteorological Organization (WMO), ranked 2005 as the second warmest year behind 1998, using different analytical techniques. But whether 2005 comes in at the first or second warmest year, climatologists agree that the five warmest years since the 1890s have occurred in the last decade. Hansen and colleagues' analysis included global surface temperature measurements from land-based stations, satellites and ships. They found that temperatures were above normal for most of the northern hemisphere, with the largest warming measured in Alaska, Siberia and the Arctic. The inclusion of anomalous warming in the Arctic, Hansen wrote, may have put 2005 above NOAA and WMO estimates, which excluded that region. The report shows that the previous decade's jump in temperature was part of a more gradual acceleration of warming that has occurred since measurements began in the late 1800s. The trend is "consistent with expectations" from climate models and "coincides" with the increase of human-caused greenhouse gases, reinforcing the need to discuss how greenhouse gas emissions can be curbed, Hansen's team wrote. Jonathan Overpeck, an atmospheric sciences professor at the University of Arizona in Tucson, says "it's clear" that some of the greenhouse gases are coming from human activity, rather than only from natural sources. "That's pretty indisputable at this point," he says. But exactly how much of that warming trend is due to humans and how much is part of Earth's natural climate fluctuations is the focus of scientifically and politically heated debate. Contributions to warming from natural variations exist on the scales of years and decades, such as El Niño and La Niña, Overpeck says. Indeed, the warming effects of El Niño contributed to the previous record-warm year of 1998. Also, natural warming contributions come from volcanoes and changes in solar output, Overpeck says. Last year, however, was neutral to the effects of El Niño and La Niña, he says, and other natural fluctuations "can't explain this accelerated warming that's going on now." This graph shows the number of degrees Celsius that annual global surface temperatures deviated from the mean temperatures recorded between 1951 and 1980 (set to zero). An anomalous warming acceleration is evident beginning in the mid-1970s. That warming contributed to warmer sea-surface temperatures, which Overpeck says might have led to the record-breaking number of named storms in the 2005 hurricane season. The high temperatures might also account for the severe drought conditions that struck the southwestern United States. Those relationships, however, cannot be confirmed with "statistical confidence." As for what temperatures the future might hold, Hansen and colleagues wrote that impending El Niño conditions for 2006 and 2007 will boost global temperatures such that the "record will almost surely be broken." Overpeck says, however, that "El Niños are not all bad." While the temperature record might be broken again, increased precipitation could allow the Southwest to rebound from drought conditions, and typically, he says, "El Niño means fewer hurricanes too."